Before the days of $4 gasoline, congested highways, and polluted air, there was a time when a commuter could travel inexpensively from one place in the South Bay to another on a clean fast electric interurban railroad. Believe it or not, Saratoga had its own version of the early twentieth century phenomena, called the Peninsular Interurban (PI). It was part of this transportation happening that took off prior to Henry Ford rolling out his model T and the Wright Brothers being able to demonstrate sustained flight. At the time of the building of the PI, the automobile was in its infancy. It was looked upon as a curiosity, a toy for the rich. Few envisioned that its early development problems would be overcome and that it would mature into a viable means of transportation. Paved roads were uncommon in Santa Clara County and it was rare to see a vehicle with an internal combustion engine on the road. The Southern Pacific Railroad, dominated travel in the Bay area. It serviced many of the towns in the county but only touched on Saratoga having a station at Congress Springs Junction, which is where today, Highway 85 intersects with Saratoga Avenue. Service was infrequent and in order to get to San Jose one had to travel by train or horse and buggy to Los Gatos and then catch a train on into San Jose. There was no direct route. In addition steam roads like the Southern Pacific were slow to start and belched cinders to and fro when traveling between towns. The city fathers of the town of Saratoga saw the lack of convenient, fast and clean transportation as a major barrier to growth and as a result they looked for a way to tie the town directly to San Jose. The answer to this civic need was a new form of transportation, the electric interurban; a form of transportation that came to Saratoga in 1904. The interurban can be looked upon as a hybrid between a railroad and a city trolley car. The technology differed from the streetcar in a variety of subtle ways. The equipment was larger, heavier, and faster than that used in the urban environment. There were a couple of technology challenges that had to be overcome if the interurban was to become commercially viable. The first challenge was to find a way of transmitting electricity over distance without losing power to run the system. Electric traction relied upon direct current motors for power but because of line loss, direct current could not be transmitted over long distances. So how does the industry address the problem? The answer was the electric substation, or powerhouse, where electricity is transmitted over high-tension lines using alternating current; then at geographically dispersed locations, substations would convert the AC power to DC power using rotary converters. Once converted, the electricity could be channeled over the line via overhead wire that the interurban car would pick up to drive its traction motors using a trolley pole. Saratoga had its own substation on Saratoga Avenue just opposite Douglas Lane. The Peninsular Interurban, which was headquarter in San Jose stretched from Palo Alto in the north, to Saratoga in the west, Los Gatos in the south and to Alum Rock Park in the East. One could board a car in Saratoga and travel to Palo Alto, San Jose, or Congress Springs with service being on the half hour over mainly a single-track line that radiated out in three directions from Saratoga. A picnic at Congress Springs, a football game at Stanford or a doctors appointment in San Jose could all be reached by interurban. The line was built in stages over the first few years of the twentieth century. The first interurban line to be built in Santa Clara County operated under the name of the “San Jose, Los Gatos Interurban Railway Company”. Businessmen F.S. Granger and J.W. Rea headed up a syndicate, who in December of 1902 incorporated the railway1. It ran between its namesake cities on a route that took it down San Carlos (Stevens Creek Boulevard) to Saratoga Road (Avenue) where it traveled south to the little lumber town of Saratoga. It then turned east to Los Gatos and ran down what is today Route 9. Willys Peck, a long time Saratoga resident, used to ride it into downtown San Jose to see his dentist, the cost of the round trip fare was twenty cents.2 Before long, competition raised its ugly head in the form of the Southern Pacific Railroad (SP), “the octopus”, who as its history would attest, was more than interested in dominating transit throughout the state including the South Bay. The SP acquired the San Jose Railroad, which ran the streetcar line in San Jose, and then announced its intention to build an interurban on a more direct line to Los Gatos through Campbell. As a result of this threat, the developers of the San Jose and Los Gatos Interurban, Granger and Rea, were eager to sell in order to avoid a conflict with the rich and immensely powerful Southern Pacific railroad. 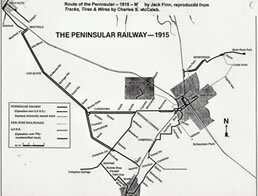 The SP purchased the line and renamed it the Peninsular Interurban (PI). Upon purchase they laid in plans to extend the line from Meridian Corners, where the line ran south to Saratoga, to a line that would run the length of Stevens Creek Boulevard to what is now Foothill Expressway for a high-speed trip to Palo Alto.3 This line opened in 1910 and became the backbone of the system. Once the line to Palo Alto was opened, the SP steam line, which paralleled the PI, discontinued intermediate stops along its route from Palo Alto to Los Gatos, stopping only at Los Altos. SP opted to employ the superior transit capabilities of the interurban over the slow and costly operation of the steam train. During the life of the railroad, it found its headquarters in two different locations. In the beginning and toward the end of service it was located in San Jose; during the intervening years it was located in Los Angeles, which was also the home of the Pacific Electric (PE), which was also owned and operated by the SP.4 The PI began to be known as the PE of the North, a compliment given the immense size and efficiency of the Southern California operation. The car barns and yards were located on San Carlos Street at what is today Stevens Creek Boulevard and Meridian. This location was on the mainline and also provided access to the SP so that equipment moves and material transfers could be accommodated between the two railroads. The PI built much of its right of way alongside existing roads within the county. In the towns along the line, they either used existing streetcar trackage as they did in Palo Alto and San Jose or in those cities that did not have streetcar trackage; tracks were laid down the middle of the main street. This proved to be a very economical way to build a railroad but in the long run it proved to be the Achilles Heel of the line because as automobile traffic grew, roads needed to be paved and the railroad became more of a nuisance than an asset to the towns along the line. In fact it is difficult to see how a 55,000-pound railroad car could share the streets of South Bay cities with today’s heavy vehicular traffic. The interurban began operation in 1904 with the initial cars being purchased from the American Car Company.5 These cars were made of wood and had been originally intended for use on a narrow gauge railroad out of Detroit.6 The cars were modified to run on standard gauge trackage prior to being delivered. 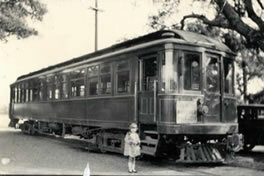 There were twelve of these cars in the initial order and they saw service from beginning to the end of service in 1934. 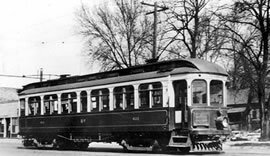 In 1910 the PI purchased a group of 15 cars from the St. Louis Car Company.7 These cars were much larger than the original series and were used principally on the Palo Alto line. Because of their size and where they ran, they were referred to as the “Big Palys”.8 These cars were later transferred to the PE when the Great Depression hit and passenger volumes dropped precipitously. The cars carried on in service on the PE for another thirty years until end of service finally came to the PE in 1963. The PI also ran a small freight operation; it carried produce, lumber and gravel to all points in the valley and interchanged freight with steam roads at different points on the line. This was never a very big business for the PI so when passenger revenues began to decline in the 1920s, there was no cushion to fallback on. In addition to carload freight the railroad provided less than a carload freight service, which was basically package delivery. They handled package deliveries at their stations and in some areas would actually pick up and deliver to customer locations along the line. This service generated a great deal of goodwill for the railroad. Planned extensions were a dream that could have had a major impact on the shape of the Bay area, given that population growth normally follows transportation arteries. The line planned three major extensions, which would have made it the major transportation network of the Bay area. One extension would have brought it north of Palo Alto to Menlo Park where it would have connected with the Market Street Railway for a one-seat ride all the way into San Francisco.12 Another extension would have been across the Dunbarton rail bridge to the East Bay where the trains would have headed north to Oakland accomplishing what today, seventy-four years later, is still a dream of urban planners. 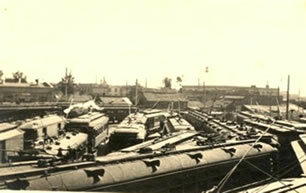 The most audacious plan was to build a line, similar to the Mt. Lowe line in Southern California, to the top of Mt. Hamilton. Given the grades of Mt. Hamilton, the line would have used a combination of technologies including rack and pinion as well as cable. Mt Lowe provided substantial tourist revenue for the PE and so therefore the PI saw this as an excellent way to generate revenue by leveraging their current investment. Needless to say, none of these plans were ever implemented. The railroad began to decline in the late 1920s. The automobile and its attendant roads were the biggest culprits leading to its demise. 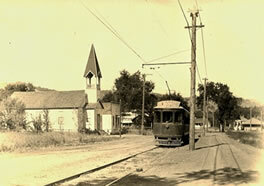 In 1929 the railroad was forced to give up its Palo Alto connection because the city wanted to pave and widen what is today the El Camino Real.13 The PI, which had been operating in the red since the mid 1920s, could not afford to buy additional right of way much less the labor to re-lay the tracks and wire required to sustain the connection. As a result the line was cut back to Mayfield.14 With the loss of the Palo Alto connection, the line could no longer connect with the SP or provide a one-seat ride to Stanford. Los Gatos was also clamoring for an end to service so they could open their streets to more vehicular traffic, The County wanted to widen its roads thereby putting additional pressure on the PI to abandon lines that ran parallel to county highways. In addition, the Peerless Stage Company received a charter for bus service on roads that paralleled the PI lines. This resulted in a level of competition that the PI could not compete with because the PI had to maintain its own right of way and pay taxes on it. Peerless was able to use county roads at no cost and did not have to maintain them. The only tax they paid was at the pump, which was a fraction of what it costs to maintain the rails. The die was cast and in March of 1934 the last car made its way from Los Gatos to Saratoga and then on to San Jose. An era of fast, clean, and relatively frequent service had come to an end. As they say “What Comes Around Goes Around “and in the case of the electric interurban nothing could be truer. The VTA’s light rail system is a reincarnation of the PI. Its routing varies from the original PI route in order to serve a different set of demographics; however the technology is much the same. 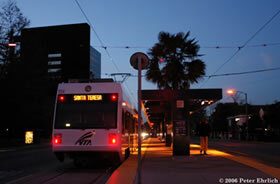 The VTA’s system began life in 1984, fifty years after the demise of the PI, utilizing overhead wire, 600-volt traction motors, car barns, motormen, and street running in downtown San Jose. The VTA line has some of the same problems that haunted the PI during its life; the major one being inadequate revenue to cover operating expenses and to service the debt. The difference today is that the VTA is a government funded and run operation where as the PI was a privately held and run enterprise. The VTA can run at a deficit while the PI could not. This is not to say that the light rail line is a mistake because its time is now coming into being. As the South Bay comes to grips with increased traffic congestion, and four-dollar gasoline, VTA ridership continues to increase. In the future, we will not be building more roads in the South Bay as land is not available and given air quality standards, we will not be allowed to build them. Given these constraints, it is easy to see that the VTA’s investment in light rail is a sound one. It is just unfortunate that we allowed the PI to expire before it had a chance to meet today’s requirements. How did it begin and what problems did it solve? At the turn of the 20th century the South Bay was an agricultural area crisscrossed by a network of dirt roads and without exception the horse was king. The Southern Pacific ran a steam line from San Francisco to San Jose with an additional line, running from the Alameda through San Jose to Santa Cruz. There were a few branch lines but in the main, service was slow and infrequent. By the turn of the century, the cities of San Jose and Palo Alto had installed electric streetcar systems but travel outside of the metropolitan areas was primarily by horse. A new solution was required which would bring country folk to the city and allow city dwellers to not only travel between cities in minutes, but also provide them with ready access to the country. The scene was set for the beginnings of the Peninsular Interurban. Should you wish to visit and ride the cars that ran through the Saratoga so many years ago, take a trip to the “Western Railroad Museum” at Rio Vista Junction, where car number 52 can be seen or travel to the “Orange Empire Museum” in Perris California where the “Big Palys” reside in their PE colors. 1Wheel Clicks, July 1944, 2. 2Willys Peck, Interview by Author, 12 February 2008, Saratoga, California, digital recording. 9Note: it was not uncommon for electric interurbans to have head on collisions at speed. The PI had one major accident where it ran into a car at an unmarked intersection killing 6. 10Charles McCaleb, Tracks, Tires and Wires 83. 11Note: The name of the Stanford football team was changed from Indians to Cardinal during the 1950s. 14Note: California Av in Palo Alto today marks Mayfield. Peck, Willys. Interview by Author, 12 February 2008, Saratoga, California Digital Recording. McCaleb, Charles, Tracks, Tires and Wires.Glendale California: Interurban Press, 1981. Hilton, George W., and John F. Due, The Electric Interurban Railway in America, Stanford: Stanford University Press, 1960. “The Peninsular Railroad,” Wheel Clicks, July 1944, Vol. 5 No. 1. Middleton, William D. The Time of the Trolley, Milwaukee: Kalmbach Publishing Company, 1967.